Mad Sin finally finished their 13th album along with their new Californian, lead guitarist Matt V?d? (Bamboula). It?s gonna be called ?Burn and Rise? ? since their indestructible Bandleader K?fte DeVille has gone through some major personal changes, which encouraged him to lose almost 40 kilo grams, the title is more than adequate. 18 new tracks, titled like: ?Last Gang Standing?, ?Geisterfahrer? (Ghost rider), "Wreckhouse Stomp", "The March of the Deviants", "9 Lives" or "Shitlist Bop? promise tension and also a bunch of surprises. 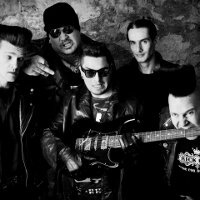 The typical Mad Sin mix of psychobilly, rockabilly, 50?s Rock?n?Roll, Country, Punk and Surf sounds fresher than ever before. Featured Artists include Sucker (Oxymoron, Bad Co.), Jack Letten (Smoke Blow), Hank (The Boss Hoss) and Marlen (Bonzai Kitten). It?s gonna be a legendary record, which gives the band once more the chance to show that they think outside the box and can do a lot more than ?just? rockabilly. A fest for your ears, which will not only speak to the rooted fans.